You may remember we started with this ridiculous thing. The hall bath. The bath all our company uses. The bath that is right off the living room. 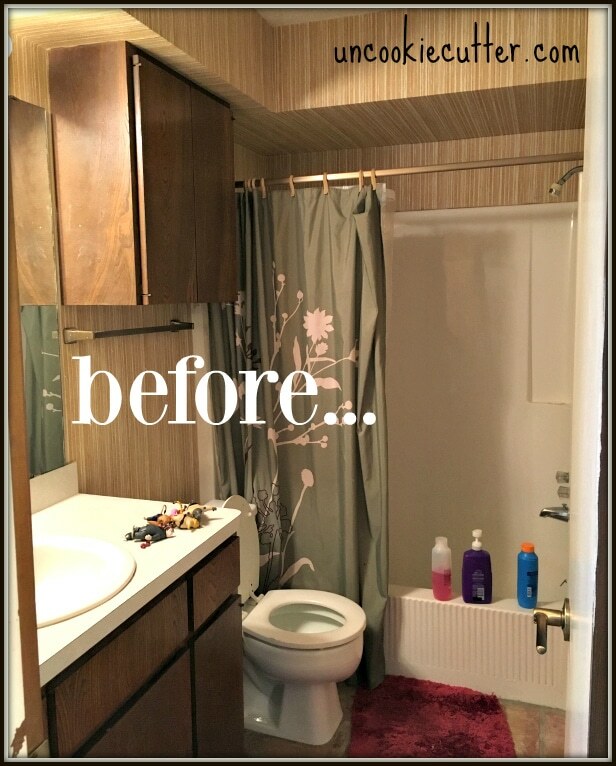 The ugly, hideous 70s bathroom. 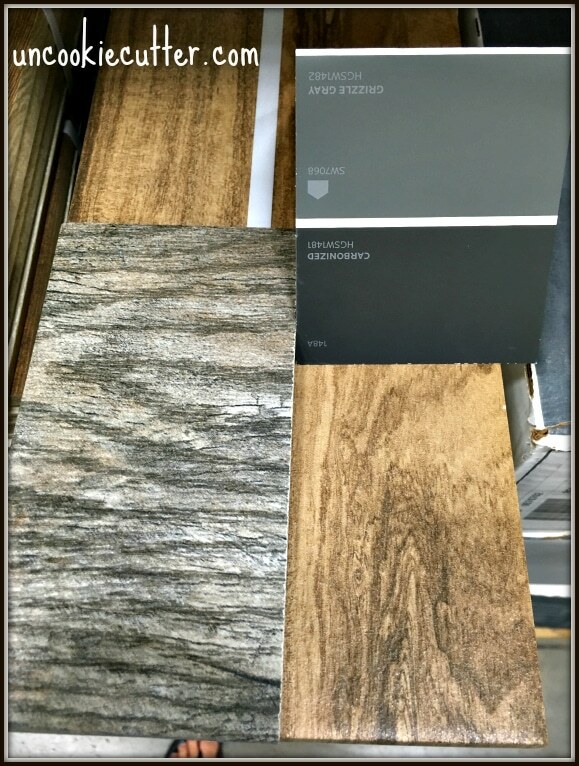 I have been obsessed with wood grain tile for awhile. You may remember my first wood-grain tile project, which was redoing my husband’s office. Well, I would like tile in every room in my house. Seriously, I love tile floors. 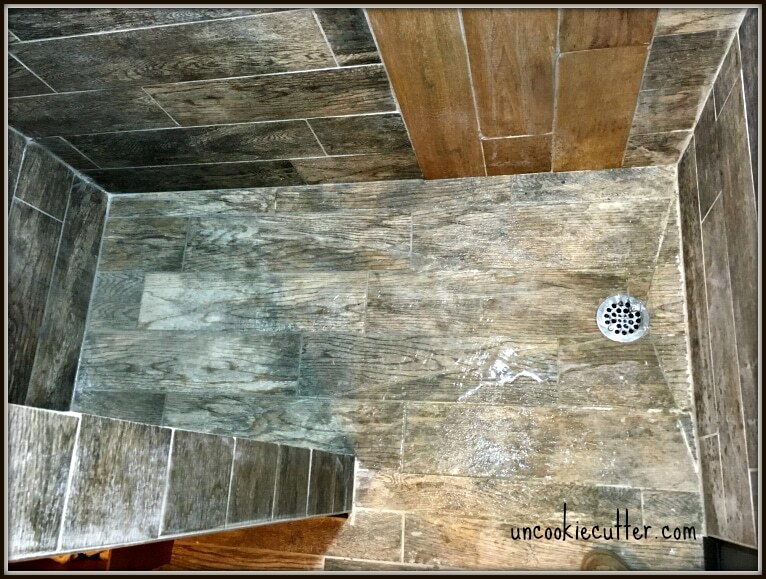 I actually did write all about why I love tile so much here, but I digress again. I saw a walk-in, seamless entry shower at a friends house and knew I wanted to try that out. No doors, or hinges or any moving parts sounded amazing. And if the whole bathroom floor is tiled, what’s the point in the door anyway? So, I had this idea to build a half wall. So, that’s what we did. We started by ripping everything out and setting the shower pan. 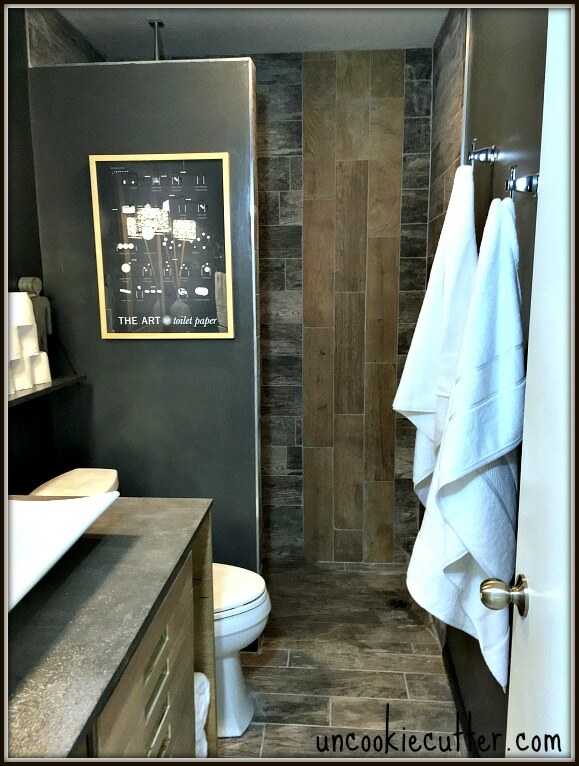 Tile Redi is a brand I found that makes seamless entry shower pans. I decided that I did want a contractor to help me with this part because I didn’t know what I was doing and wanted to make sure we got it right. The layout here is actually designed to move as little plumbing as possible. We didn’t’ want to move the toilet, so the wall had to go where it is. So the shower head had to be moved. That wasn’t that big a deal at all because we ripped out the drop down header and all the drywall in this room anyway. So, then it was just basically just extending the pipe. But, the drain was a different issue. We initially thought we would have to move the drain under the shower head, but since we have no crawl space and our house sits right on the slab, moving a drain was going to get real pricey real quick. So, I got to thinking, what’s the point? Why can’t the drain just stay where it is? All the water will drain down and you don’t have to step on it while your showering. Nothing but nice, smooth glorious tile under foot. Did I mention I love tile? Anyway, stay with me here. I’m slowly getting to the good stuff. 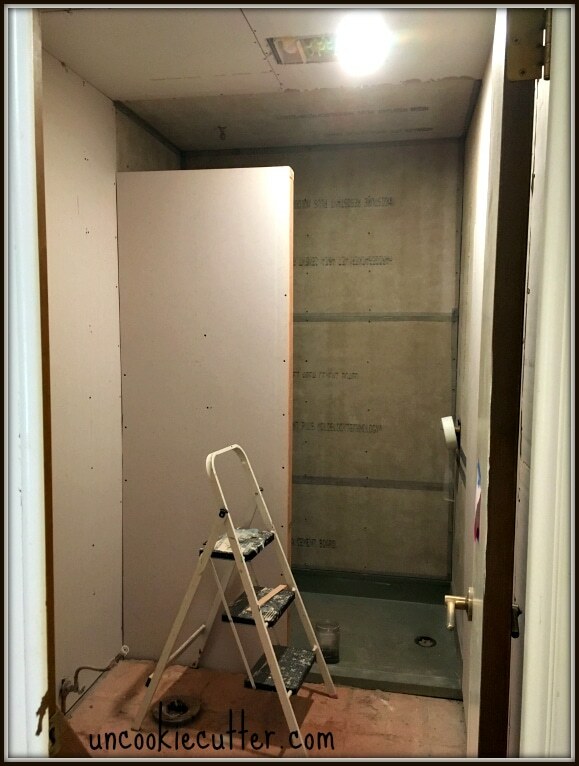 After we put the pan in, we put cement backer board all on the inside of the shower. Basically, anywhere the tile would go and possibly water. Even the ceiling got backer board. 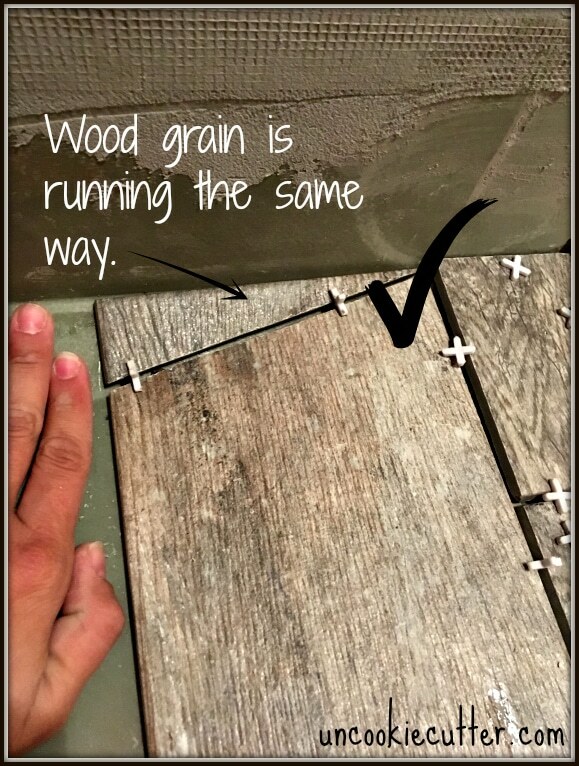 If you don’t’ know about cement backer board, don’t’ worry! I’ve got a post about that too HERE. This post is already too long…. 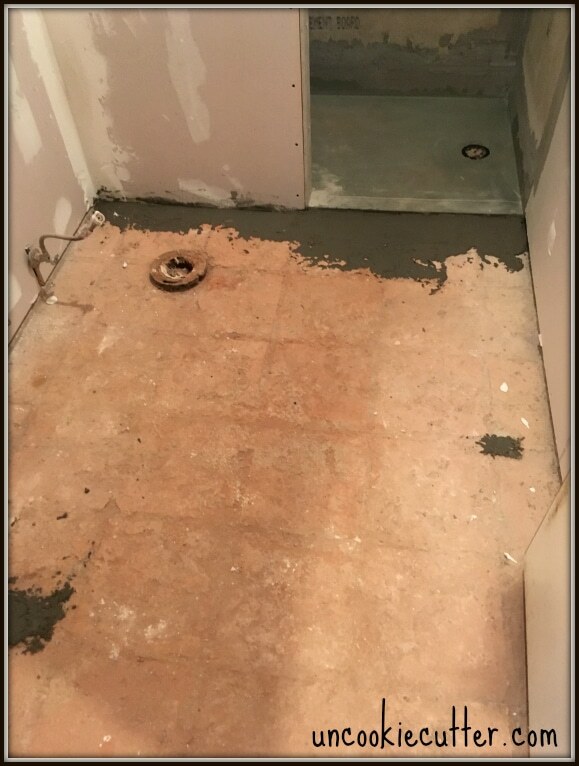 The next part was to pour self-leveling concrete on the floor where the old tile used to be and right up to the shower pan. Read about that experience here. I had to use mortar to fill the hole and then I feathered it down to the old floor base. 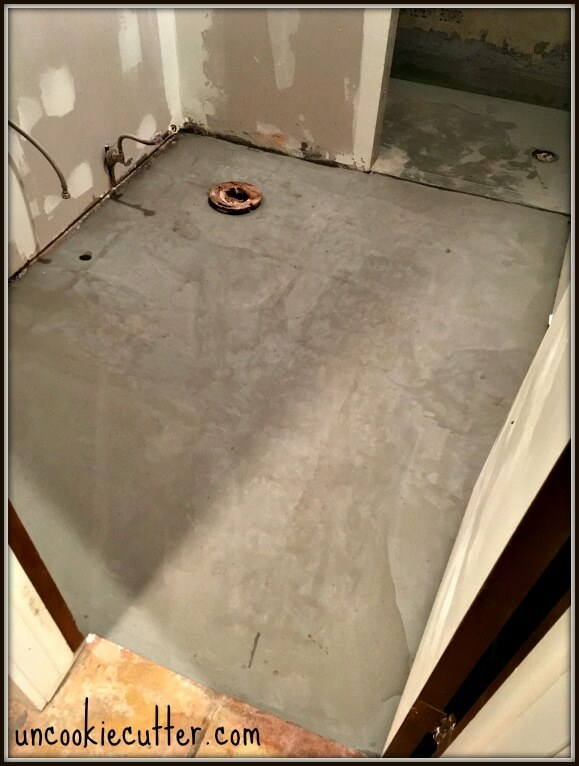 Then I poured the self-leveling concrete. 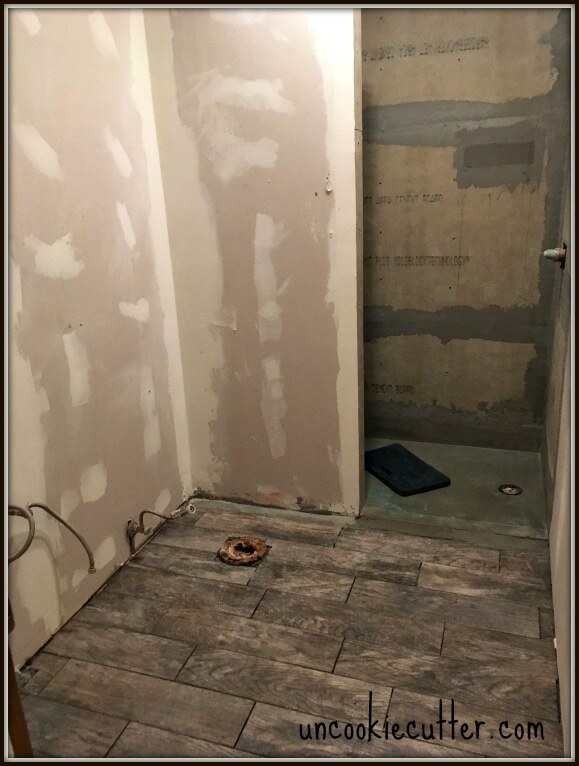 Anywho, once the shower pan was in, the wall was built, the backer board installed and floor resurfaced, we were ready to tile. 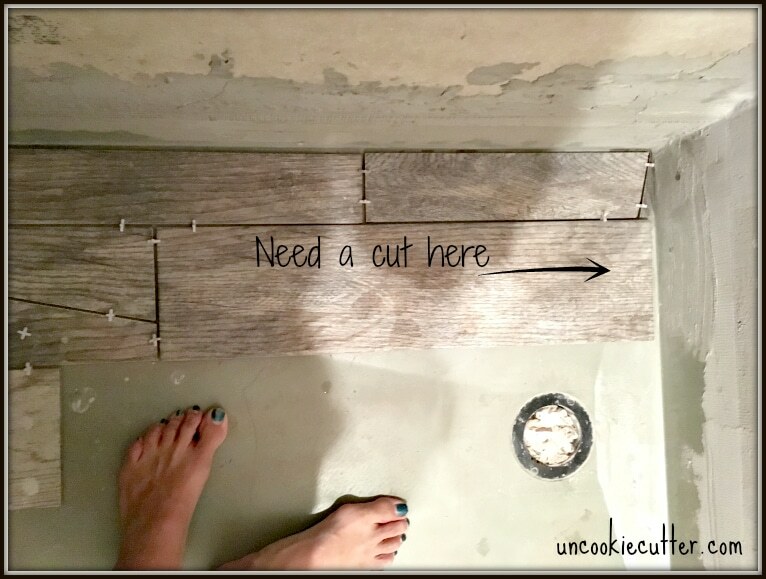 I tiled the bathroom floor first, and you can get more info on how to tile here. Just regular ‘ol floor, no biggie. Then I hit the shower pan. When the shower pan arrived, and I was looking at it with my contractor, he said “this is going to be tricky with those long pieces of tile”. But I WILL NOT BE DETERRED y’all. 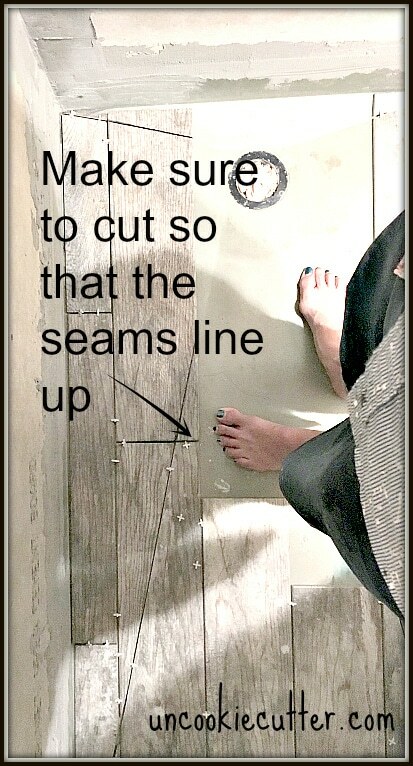 I was determined to have the wood grain floor in that shower. Here was the issue. The pan is sloped down toward the drain. Which totally makes sense, right? You want the water to go to the drain. 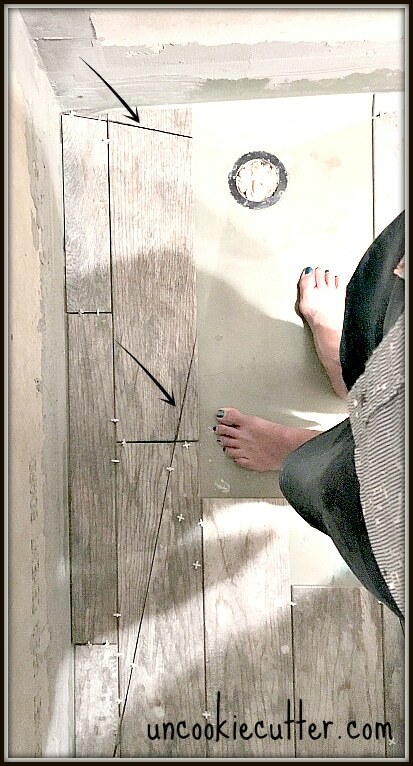 But, a long piece of tile is not going to lay flat on a sloped floor. My guess is this is the reason you don’t see a lot of big pieces of tile on a shower floor. So, basically what I had to do was cut a bunch of angles. To do this, you’ll have to be prepared to cut a lot. I needed more tile than I normally would for this size space. You have to follow the lines on the shower pan. This was tough, mainly because it’s hard to make a line on the tile that doesn’t wipe away when it gets wet. TileRedi has a special water proof mortar that you use to stick the tile to the pan. 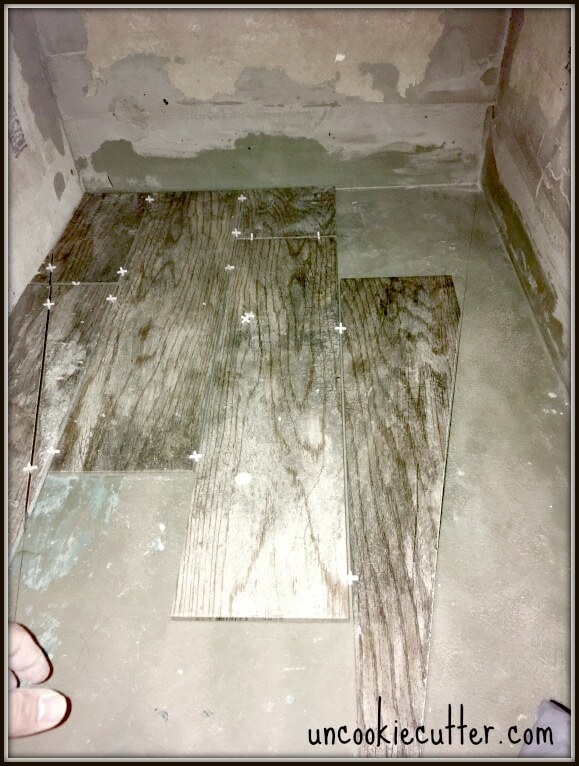 I cut all the pieces out first because you only have about 45 minutes to lay the tile once you mix the mortar. 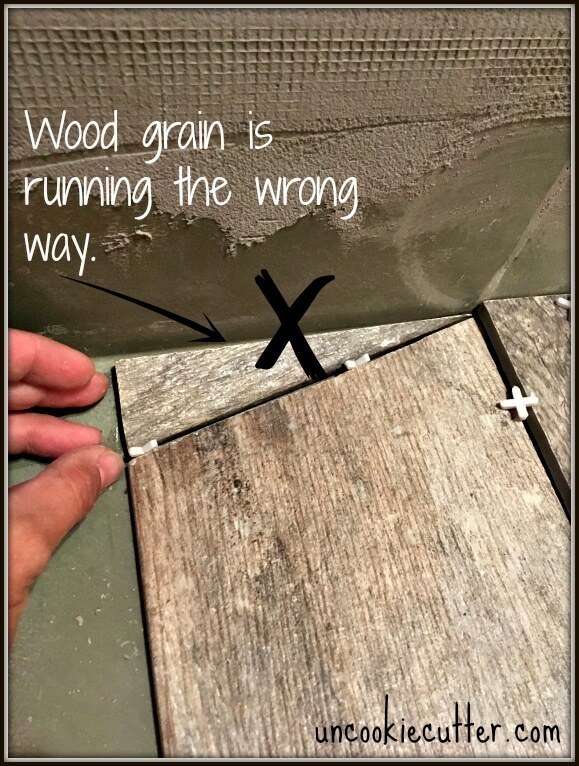 You have to make sure you end the tile pieces look like a piece too. I cut a few without lining the ends up and it just looked off. Another thing you have to consider is the direction of the wood grain. You’ll be tempted to use the little scrap pieces to fill in pieces like this, so make sure you get that going the right way. After I got the floor tiled, the walls were easier. I searched and searched a searched for an accent tile and couldn’t find one I liked that fit with the mood of the room. I had the idea just to mix another wood tile with it, but I thought that was dumb. Then I called my friend Kim and she said “why don’t you just mix another color wood with it”. Ah, great minds, am I right? Anyway, I bought some different wood grain tile and laid it all out. This will work I thought. And it did! After that, the only challenge was the shower nook, but I’ll write all about that next week. 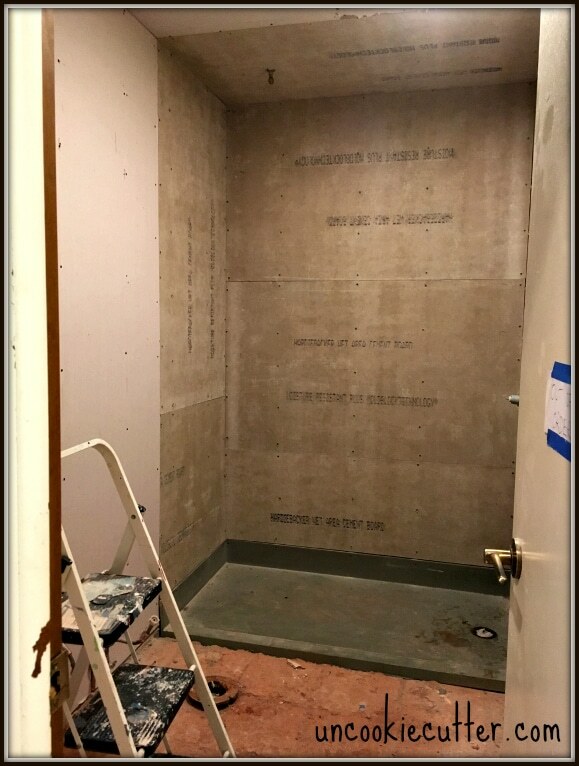 So, if you are planning on attempting a walk-in, seamless entry shower and have any questions, please ask! I know this is a little lengthy, so ask away. That looks amazing. I do love a walk-in shower. 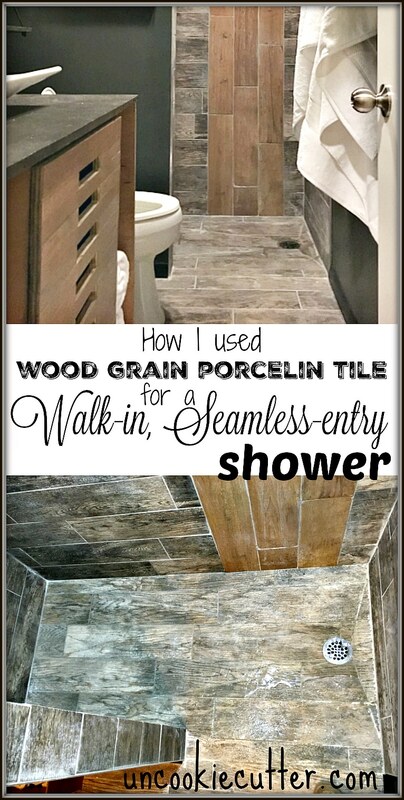 Yes, there is a reason everyone uses small tile for sure!